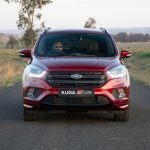 “The new Ford Kuga is an exceptional offering in the highly competitive SUV segment, and we’ve now made it even more appealing to buyers across the spectrum,” says Doreen Mashinini, General Manager, Marketing at FMCSA. 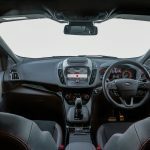 “At the pinnacle of the range, the stunning new ST-Line gives the Kuga the eye-catching design and dynamic flair to match the superb performance of the 2.0-litre petrol and diesel models. “At the same time, the introduction of the extremely efficient yet lively 1.5-litre TDCi engine ensures that we fulfil the requirements of customers that prioritise low fuel consumption and budget-friendly running costs,” Mashinini adds. 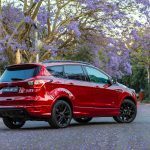 The new Kuga ST-Line delivers the sportiest driving dynamics yet for this model, with chassis enhancements incorporating optimised suspension and steering. The revised set-up benefits from thicker anti-roll bars, a 10mm lower ride height for reduced body roll and sharper responses, as well as the fitment of stiffer suspension bushes. Spring and damper rates have also been fine-tuned to deliver unparalleled comfort and performance. 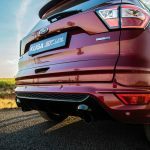 For the first time the Ford Kuga will be available with a frugal yet punchy 1.5 TDCi turbodiesel engine.